The 2017 Nissan Versa starts at $12,815, making it the least expensive brand-new car available in the U.S. But it's not bare-bones, coming standard with air conditioning and Bluetooth, and you can add a lot more for not much money with the new SV Special Edition. Unfortunately, fun-seekers should look elsewhere, as the Versa emphasizes transportation, not driving entertainment. Great vehicle for a great price! I have had this car for almost 2 years and it has been great!! I have not had any issues. When purchasing the vehicle I noticed that there was not an adjuster for the height of the seats. This would be my only issue with this vehicle. It comes with Bluetooth capabilities for phone calls and an auxiliary jax for music. The inside is very spacious, which was something I was looking for in my new vehicle. It also has a large trunk!! You can fit a lot in this car!! The model I chose is a manual transmission, and it catches every so often even though I do not feel like my timing is off. But maybe that is just me. It looks tiny in the outside, on the inside its actually comfortable spacious. 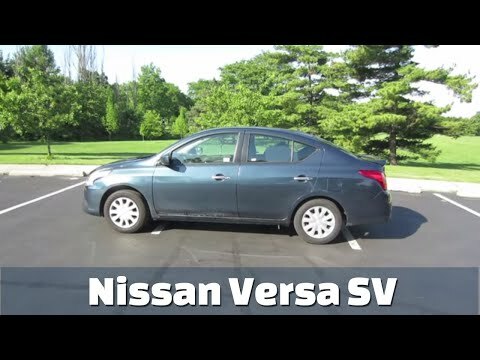 The Nissan versa sv sedan is a great beginner economical and gas efficient car. It is wonderful on gas, which is why it won me over to begin with when selecting a Nissan vehicle due to travels from university and home. The car also contains padding in the driver seat which also makes the drives comfortable. The only one issue I would say is the location of the cup-holders in the front, they are located somewhat under the radio and a/c unit which makes it awkward to put and take your drinks, other than that it's a great, comfortable economical and gas efficient car. 2017 Nissan versa sv engine coolant odor. My 2017 Nissan versa sv is a good vehicle. It gets really good mileage and is easy to maintain. My complaints about the car are that if you idle it for to long or park too long at red lights, a strong odor of engine coolant appears. I have had the dealer check this problem out but was told that this is normal. My other complaint is that the vehicle is slow and sluggish when accelerating, but it only has a 1. 6 liter engine and this is normal. I have no other issues or pet peeves about the car. Nissan North America, Inc. (Nissan) is recalling certain 2017 Versa, and Versa Note vehicles. The ring plate that secures the air bag cushion to the passenger frontal air bag assembly may fail, possibly causing the air bag to deploy improperly in the event of a crash. In the event of a crash, if the passenger frontal air bag does not deploy as intended, it can increase the risk of injury. Nissan will notify owners, and dealers will replace the passenger frontal air bag module, free of charge. The recall began June 12, 2016. Owners may contact Nissan customer service at 1-800-647-7261. Nissan North America, Inc. (Nissan) is recalling certain model year 2017 Versa vehicles manufactured August 1, 2016, to August 16, 2016. A seam in the fabric section of the side curtain air bags may tear during side curtain air bag deployment, potentially affecting the performance of the air bag. As such, these vehicles fail to comply with the requirements of Federal Motor Vehicle Safety Standard (FMVSS) number 226, "Ejection Mitigation", and number 214, "Side Impact Protection." In the event of a crash necessitating side curtain air bag deployment, if the side curtain air bags do not deploy as intended there would be an increased risk of injury. Nissan will notify owners, and dealers will replace the left and right side curtain air bags, free of charge. The recall began on December 2, 2016. Owners may contact Nissan customer service at 1-800-647-7261.